Does The Multiverse Make Sense? : 13.7: Cosmos And Culture The multiverse is supposed to be the mother of our Universe, and a multitude of others. But can we ever be sure of its existence? And if we can't, is this science? A portal to another universe? No, just the Trifid Nebula, a massive star factory. 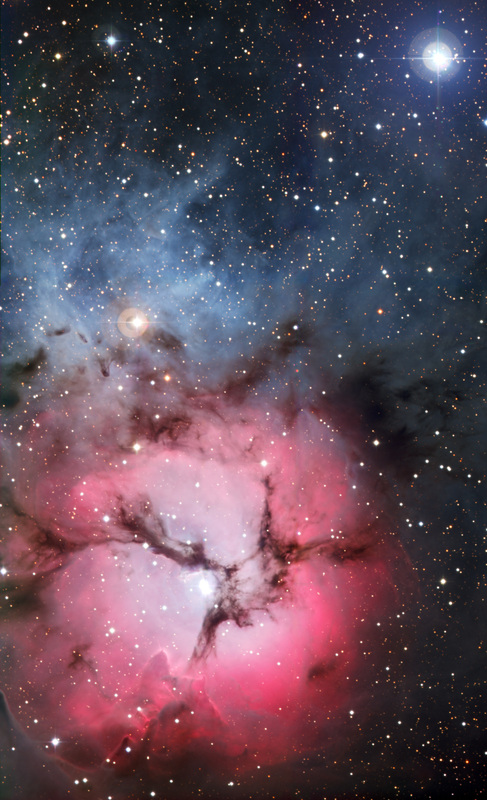 This amazing image was captured by the European Southern Observatory's La Silla facility in northern Chile. It's good to start by explaining this title since, to most people, "multiverse" isn't even a word. The idea is that our Universe (with capital "U") is but one amongst a multitude of other possible universes, all part of a single multiverse. The multiverse, in turn, could be an eternal, timeless entity. With this, what we call the Big Bang would be the event that marked the beginning of our cosmic narrative; other universes would have their own big bangs and cosmic narratives. The question of a "Beginning" would then be swept under the carpet, so to speak, since the multiverse has no history. This is reminiscent of the old "steady state universe," an alternative to the Big Bang model proposed around 1948 by a trio of British cosmologists, including the one-and-only Fred Hoyle. In the steady state model, the Universe was eternal; to compensate for the cosmic expansion and subsequent thinning out of matter, more matter would be created in just the right way so as to keep the average density constant: think of a bath tub where the same amount of water that comes in through the faucet goes out through the drain. In a sense, the multiverse is an extrapolation of the steady state model, encompassing a huge number of possible universes instead of just one. It's not just matter being created in a single Universe, but universes being created in a single multiverse. Over the years, cosmologists have proposed different types of multiverses. In some the laws of Nature could vary from region to region of the multiverse so that different universes would have different laws of physics. At present, such ideas are more metaphysical than physical. In others, different universes have the same laws but the constants of Nature (e.g., the mass and charge of the electron, the mass of the Higgs, the strength of gravity etc.) can vary from universe to universe. This notion is consistent with superstring theory, the present-day attempt to build a theory that unifies all forces of Nature (four in total — for now), the so-called theory of everything or T.O.E. At present, we don't know if the multiverse exists. Or, if it does, if we could ever find out. It's possible that our Universe is all there is. However, if this is the case, we must explain why this Universe, with its properties, and not another one. Especially if we take superstring theory seriously and conclude that the multiverse must exist and that each universe would have different physical constants and hence different physics. Would our Universe be the exception or the rule among all possible universes? How to determine this? Some physicists are trying to develop a statistics of universes, a measure of probability to apply to the multiverse so as to determine the odds for a Universe like ours. An obvious answer is "why bother?" We are here, our Universe obviously exists and that's it. But it's hard to accept this kind of answer. We are culturally programmed to find final explanations, to craft narratives with a beginning, middle and end. It's very difficult for us to accept that something may not have had a beginning. Even harder is to imagine that something could pop into existence without a cause, the famous creatio ex nihilo from theology. In the final analysis, the existence of the multiverse, if it is a scientific question, must be determined experimentally. At the moment, some scientists are trying to find what possible signatures other universes may have left imprinted in ours. For example, if another universe "collided" with ours in the past, it may have caused perturbations in the cosmic microwave background, the repository of radiation left over from the epoch when the first atoms were made, just 400,000 years after our Bang. Think of the jiggling vibrations of two balloons banging on one another. Unfortunately, so far the models are simplistic and no obvious signature has been found in the skies. Also, even if we could detect the unambiguous signature of other universes, we still could not state for sure that they came from a multiverse. One of the problems science faces when confronting these kinds of questions is the notion of infinity. How can we test a theory that predicts a universe that exists forever? To empirically test such a prediction we would need an experiment that also runs forever, an impossibility. Even if we could prove that the multiverse existed, we could not prove that it is eternal. We witness the collision of two realms: one, the theorizing realm of ideas, which can dream of infinite time with Platonic impunity; the other, the all too human realm of science, where the passage of time, and our limitations as finite beings, create an unswerving contract with history.